to make her way to February’s zenith. She rises on time, a beacon fully seen. of Tranquility is next to the Sea of Crises. Wolves howl, but she persists. 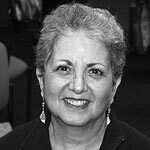 Joan Mazza has worked as a medical microbiologist, psychotherapist, seminar leader, and has been a Pushcart Prize nominee. Author of six books, including Dreaming Your Real Self (Penguin/Putnam), her poetry has appeared in Rattle, Off the Coast, Kestrel, Slipstream, American Journal of Nursing, The MacGuffin, Mezzo Cammin, The Potomac Review, and The Nation. She ran away from the hurricanes of South Florida to be surprised by the earthquakes and tornadoes of rural central Virginia, where she writes poetry and does paper art. You can learn more about her at her website joanmazza.com. Featured image: Untitled by Stephen Rahn. Public domain.